In a Nutshell: Consumers who are searching for a new financial services provider no longer use name recognition as their deciding factor. With more options than ever, the institution with the lowest fees and convenient accessibility often attracts the most new customers. More than 1,000 card providers, including banks and credit unions, partner with Allpoint to eliminate ATM surcharges, one of the most common fees incurred by customers. The Allpoint surcharge-free ARM network features 55,000 ATM machines placed throughout the US, Canada, the UK, Puerto Rico, Australia, and Mexico in heavily trafficked areas including chain stores like CVS Pharmacy, Target, and Walgreens. Institutions of all sizes turn to Allpoint to enhance or outsource their ATM network while reducing costs and increasing customer engagement. Like dogs and cats, or Tesla and Edison, the natural enemy of every banking customer is the fee. The charges added to products and services keep institutions operational, but fees are seen by many customers as hidden inconveniences that make storing and accessing their money more difficult— and more expensive. Fewer charges are as despised by customers as ATM fees. Customers pay an average of $4.69 for out-of-network ATM transactions to access their money, which can be excessive on smaller withdrawals. Many banks and credit unions provide fee-free ATM terminals in their service areas, but maintaining a large network of machines spread across convenient locations can be costly for larger banks and downright unprofitable for smaller institutions. 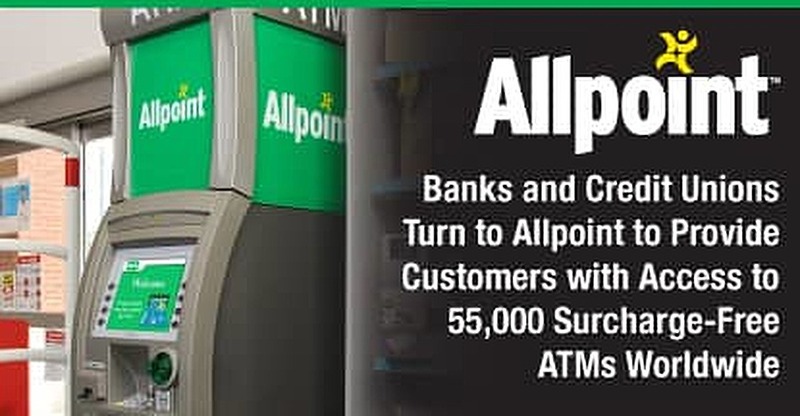 As a result, hundreds of financial institutions have partnered with Allpoint, whose iconic green logo can be spotted on ATM machines in popular shopping areas and other heavily trafficked locations around the globe. Customers of more than 1,000 card providers, including many banks and credit unions, are given access to 55,000 terminals in the Allpoint surcharge-free ATM network. Allpoint ATMs can be found throughout the US, Canada, the UK, Puerto Rico, Australia, and Mexico. The expansive network allows banks and credit unions to meet their customers wherever they may be and offer the convenience of widespread, surcharge-free access to their cash. That accessibility can greatly improve a relationship between a consumer and their financial services provider. Allpoint ATMs can be found throughout the US, Canada, the UK, Puerto Rico, Australia, and Mexico. Despite the growing popularity of digital transactions, recent studies show cash is still king in the payments world. Cardtronics’ 2017 Health of Cash Study found that nine out of 10 consumers polled used cash in the past six months to complete a transaction. More than 80% use it on a monthly basis. 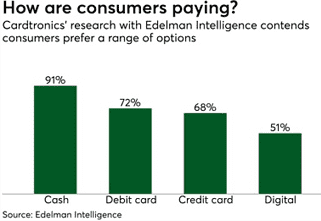 “Cash continues to resonate with American consumers who show little interest in being ‘all in’ with cashless payments, or having their choices limited in any way,” Pappathopoulos said. But as financial institutions continue to focus on increasing efficiency while lowering costs, expanding ATM networks isn’t feasible — despite the customer demand. “The Allpoint Network is here to help financial institutions give their customers what they want: the freedom to get cash where and when they want, virtually wherever they are – and surcharge-free, of course,” Pappathopoulos said. 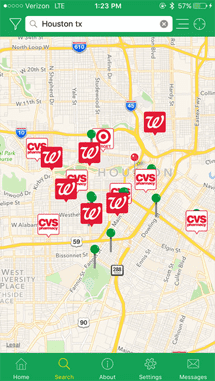 Allpoint ATM machines are easy to spot in many regional stores, as well as national chains like CVS Pharmacy, Speedway, Target, Walgreens, and the Kroger family of grocery and convenience stores. That level of access keeps customers happy and engaged with their accounts. Pappathopoulos said many consumers reach out to Allpoint through social network platforms to see if they have surcharge-free access to Allpoint ATMs. To better answer those questions, the company placed a “Do I have Allpoint Access?” button prominently on its website. This enables consumers to find out if their bank, credit union, or prepaid card provider is an Allpoint member financial institution — with in-turn makes their cardholders eligible to access the Allpoint surcharge-free ATM network. The company also offers and experiences heavy traffic on its mobile application. The app uses geolocation services to determine the customer’s location and pinpoint the closest Allpoint ATM in the area. Many community and mid-sized financial institutions leverage partnerships with Allpoint to match or exceed the ATM networks offered by their larger competitors. But Allpoint is also attractive to those larger institutions as each looks to cut operational costs. Since 2016, Allpoint has added major institutions including Fifth Third Bank, First Tennessee Bank, and BMO Harris Bank to its list of 1,000 network members. In 2017, Citibank cardholders gained expanded surcharge-free ATM access, powered by the Allpoint Network. Credit Unions and online banks remain a staple of Allpoint’s customer base — a list that includes Pentagon Federal Credit Union, Digital Federal Credit Union, Alaska USA Federal Credit Union, Alliant Credit Union, Ally Bank, Capital One 360, and Discover Bank. Technology has done for banking what electricity did for businesses in the early 20th century — it’s done away with mandatory hours of operation and made accessing goods and services at any time, day or night, much easier. Like Tesla and Edison used electricity to create a historic feud, financial institutions are leveraging technology to wage battles against one another. But that technology comes with a cost — fees. Allpoint’s mobile app lets customers find nearby fee-free ATMs. Services like mobile banking and online account-to-account transfers are offered free of charge to customers of most banks and credit unions. Such services make it hard for many consumers to justify paying upwards of $5 to access their own money through an ATM machine when they’re out shopping. Providing large numbers of machines in convenient locations, though, isn’t financially feasible to most institutions. Allpoint has found a middle ground with its network of 55,000 surcharge-free ATMs spread across popular worldwide locations. Customers of the 1,000 member banks, credit unions, and prepaid card programs can access their cash conveniently and surcharge-free. “Allpoint is committed to growing what is already the world’s largest surcharge-free ATM network with high-quality locations defined by engaged retail partners that share our vision for delivering value-added service to our financial institution members and Allpoint-eligible cardholders,” Pappathopoulos said. Providing customers access to their money without a fee not only increases their overall satisfaction with a brand but can also improve their engagement with a company and their account, leading to the addition of more services down the road. That problem is one Allpoint solves thousands of times each day when customers swipe their cards to access their money without paying a fee.